Acai is described as a “super-food” with an extremely high ORAC value of 161,400! This makes it one of the most antioxidant foods on the planet. By virtue of their ability to reduce oxidative stress, phytochemicals such as polyphenols are the main plant constituents responsible for this antioxidant activity (specifically anthocyanins and proanthocyanidins), and there is perhaps no better source of beneficial phytochemicals than the Acai berry. Berry extracts are part of a group called “OPCs” or oligomeric proanthocyanidins (OPCs). The fruit and bark extracts that make up OPCs are purported to offer a host of health benefits, including anti-inflammatory action and the prevention of wrinkles. 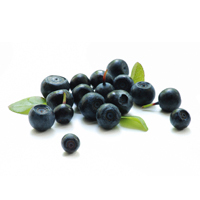 Acai is unusually rich in total phytosterols, particularly beta sisterol (around 90% of the total phytosterols). It is primarily used as a dietary supplement to help maintain body, brain and skin, and reportedly provides increased energy levels, improved sexual performance, improved digestion, detoxification, improved skin appearance, improved sleep, reduction of cholesterol levels, and more. Cosmetic companies are just now exploring the benefits of slathering it on skin and hair. The fruit is particularly rich in fatty acids, feeling oily to the touch. It contains high levels of the desirable monounsaturated oleic acid (Omega 9) and the polyunsaturated (Omega 6) linoleic acid. Besides these heavy-hitters for skin, Acai is chock-full of nutrients: an almost perfect essential amino acid complex, minerals, B Complex vitamins, trace minerals, several known and unknown flavanoids, and vitamins A, C, and E.
more on acai herbal extract . . .